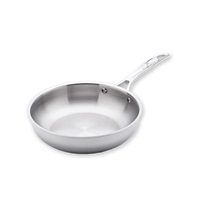 The USA PAN 5-ply Stainless Steel 8 Inch Chef Skillet is premium cookware that provides home chefs the ability to make the perfect omelet, stir fry, or sautéed vegetables. Cover sold separately. 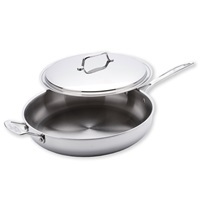 USA PAN 10 Inch Gourmet Chef Skillet has cast stainless steel handles, stainless steel rivets and features an easy pour rim. Energy efficient, the USA PAN 10 Inch Gourmet Chef Skillet is also suitable for cooking on low or medium heat. Cover sold separately. 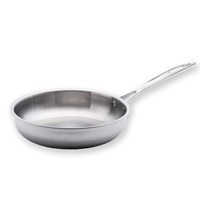 The USA PAN 13 Inch 5-ply Stainless Steel Gourmet Chef Skillet with Cover is premium cookware that cooks your food the way it should -- rich with flavor and packed with nutrients. The aluminum core and technologically advanced metallic design allows for maximum heat transfer, even heat distribution, and efficient browning.